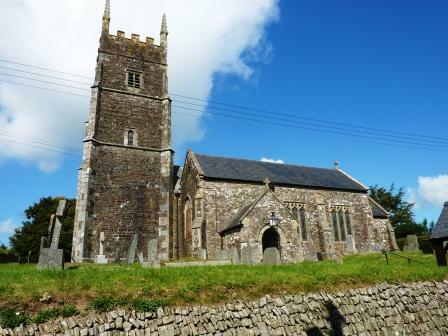 The three villages of Dolton, Dowland and Iddesleigh run in an approximate North – South line each separated by about 1 mile. Dolton is the largest and most northerly and is about 10 miles SE of Great Torrington, Devon. Roborough is somewhat separated and about 5 miles North of Dolton. 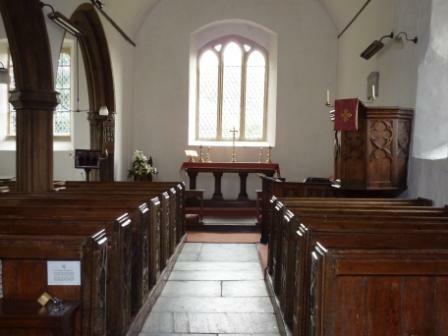 Stafford Barton, the family home of the Stofford/Stafford/Kellaways for about 700 years is close to Dolton and the churches of these vilages contain several monuments to the family including stained glass windows, carved bench ends and burial tablets. 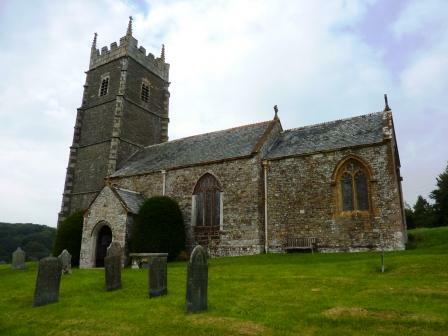 The Parish Church of St Edmund dates from C13 with C16 additions. It was restored and partially rebuilt in 1888. 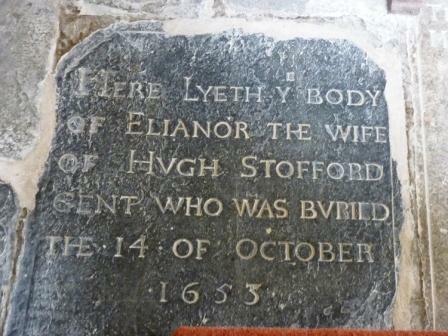 The Font is of particular interest as it consists of two carved Saxon stones which may well be over 1000 years old. 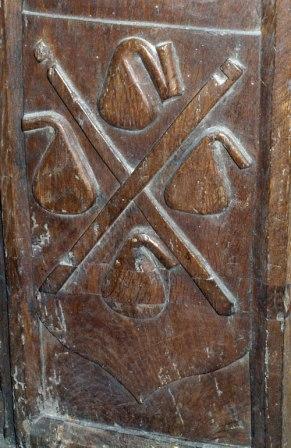 There are four very old carved bench ends, each divided into upper and lower panels. 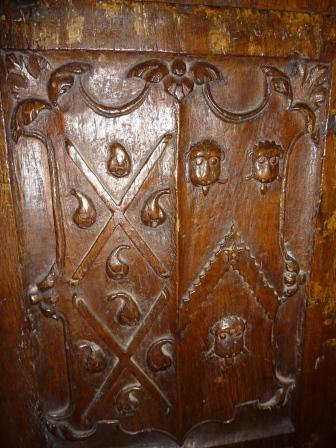 The lower panels are abstract carvings. 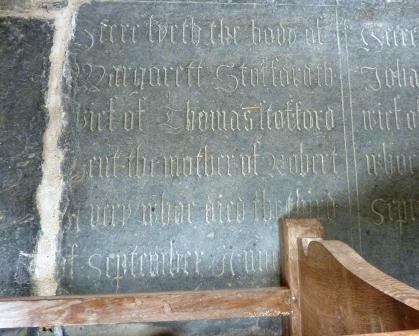 One of the top panels is blank and the other three commemorate Stafford events. 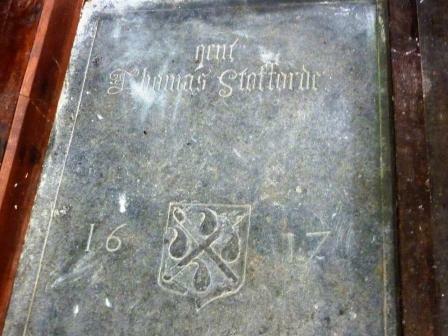 One dated 1581 has Stafford arms and the initials J.S. 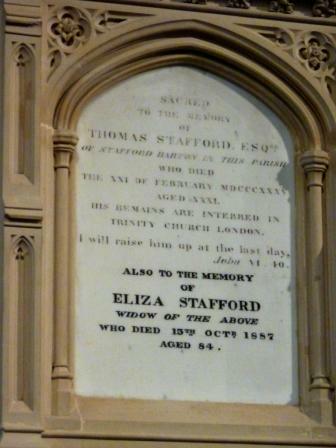 for John Stafford. 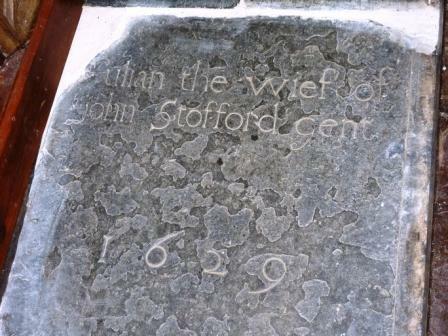 It is not entirely certain which John Stafford this refers to, probably John born c.1530 and it could be the date of his death. 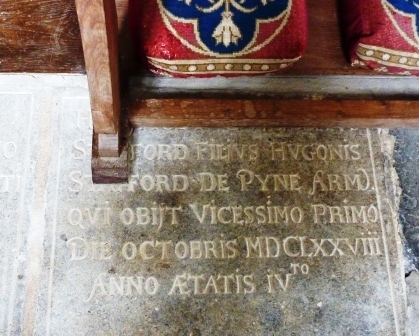 A second has Stafford Arms impaled with Copplestone for the marriage of Thomas Stofford and Ann Copplestone c.1450 and a third has Stafford arms impaled with Prouz for a marriage of Thomas Stofford with Prouz c.1360. 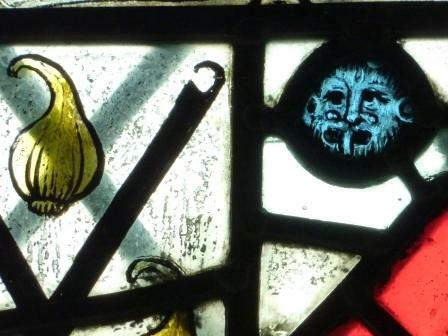 There are two stained Glass window panels commemorating firstly the Thomas Stofford and Ann Copplestone marriage c.1450. 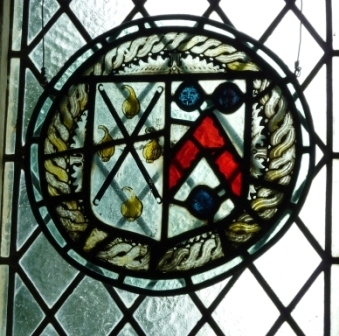 This shows Stafford Arms: Argent two glaziers′ irons in saltire sable between four pears or: impaled with the chevron and leopard′s faces of Copplestone. The glaziers seem to have an interesting take on these images. The pears resemble shallots and the leopard′s faces when seen close up reveal a very different creature! 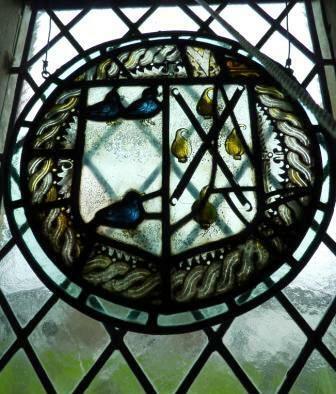 The second window commemorates the marriage between Philip Stafford and Alice Yeo c.1480. 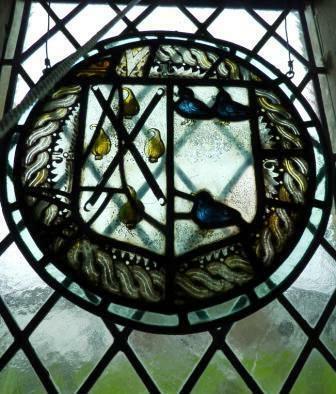 This window when seen September 2009 had been mis–hung and reversed. It should appear more like the second picture which has been flipped round. 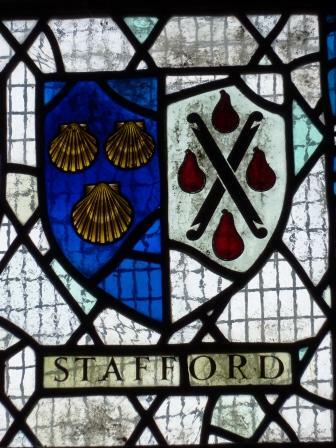 The arms are Stafford impaled with the three ducks azure of the Yeo family. Earlier photographs in the church show this window hung correctly. 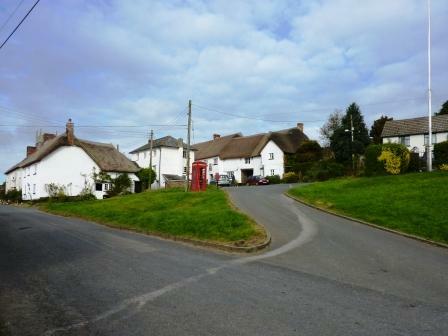 Dowland is a much smaller village and is about 1 mile south of Dolton along a very narrow road. 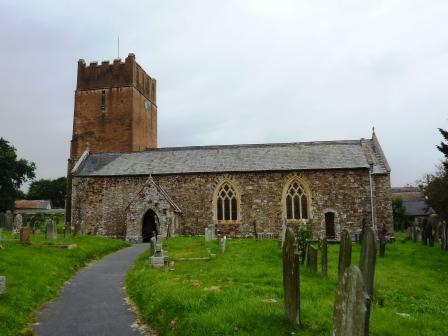 The Parish Church of St Peter has some Norman fabric with the tower added C15, futher additions C16 and restoration in 1876. 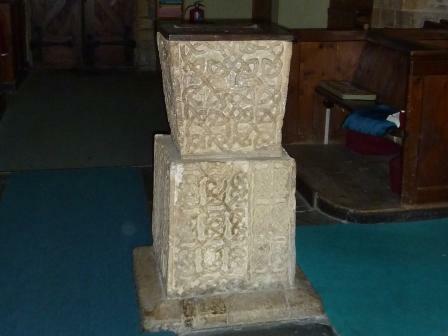 The late medieval Font is roughly Octagonal and stands on a C20 base. 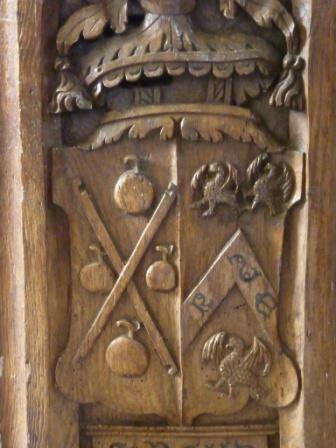 This bench end has the Stafford Coat of arms with Menwenick. The pears look very much like apples. 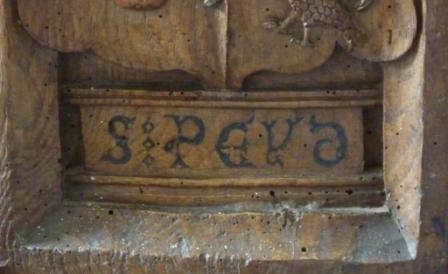 The letters on the chevron are R ~ E.
The date carved above is 1546. The southern most of the three villages is again very small with just a small number of thatched cottages and houses. 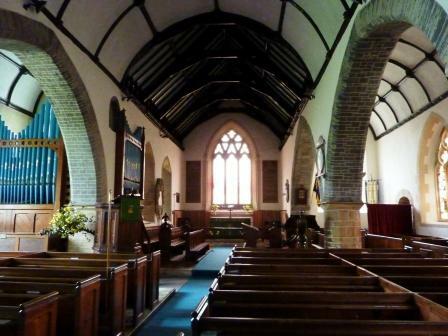 The Parish Church of St James has C13 origins but the main fabric is C15. It was partly rebuilt and restored in C19. The octagonal Font dates from about 1538. Parish Registers begin in 1541 and are entered into IGI. 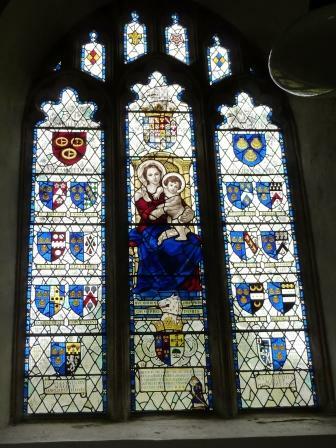 Nearby is Ash the Family seat of the Mallet family and there is a striking stained glass window in St James′ Church, erected in 1939 by Sir Claude Coventry Mallet, K.T., C.M.G., and Lady Mallett, C.B.E., in memory of the Mallet family. 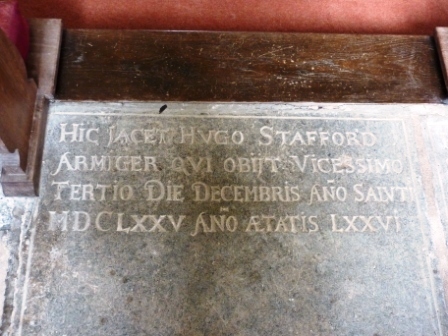 It commemorates the history of this Mallet family and the many marriages including one for William Mallet and Susanna Burnaby Stafford c.1575. 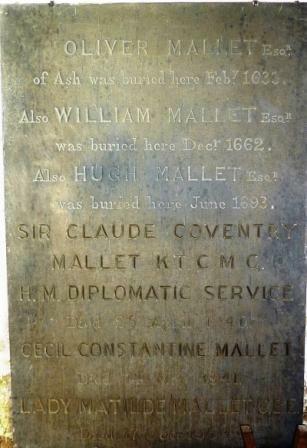 In the church there is a Headstone Memorial to Oliver Mallet (son of William Mallet and Susanna Burnaby Stafford) and later Mallet descendents. 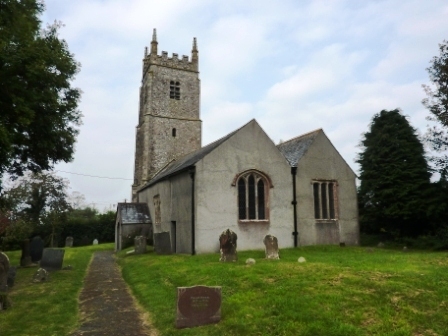 MALLET K T. C M G.
The Parish Church of St Peter dates from C13. 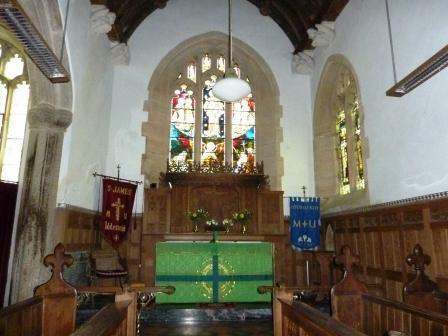 There is a 15C Tower but much of the rest of the church was rebuilt in 1868. 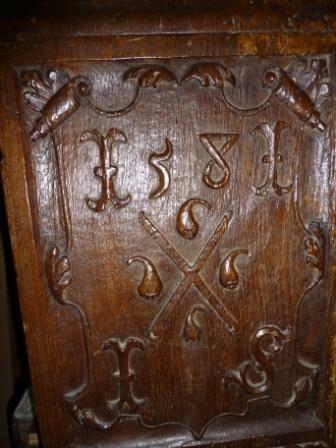 There are a number of 15C carved bench ends. 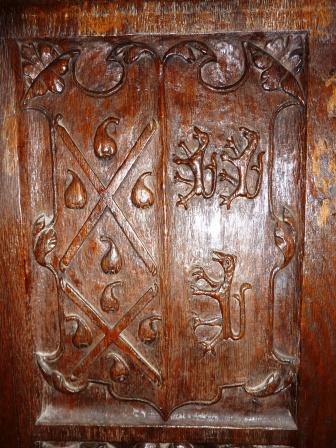 One of these shows the Kellaway/Stafford Coat of Arms.